I have always been the one person in our family with a camera in hand, you know, the one you can depend on to keep the memories alive or the one you dread to see coming. I call it a passion, my husband says it is an obsession, either way, photography is a part of my life and I love it. My Grandmother, who has always been a huge inspiration in my life, once said "people look at the beautiful clouds in the sky, the harvest moon, a starry night or a field full of breath-taking flowers but not everyone "sees" the beauty or appreciates what God has created"...but I do and I try capture those moments every chance I get. I am sentimental like my Dad, have my Mom's silly personality and I absolutely love people and animals. 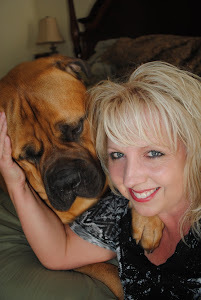 I am very blessed and I am so thankful to God for my family, friends, and my animals especially my big Bullmastiff, Gus. I can't believe I finally have a blog! I am so excited...I hope you enjoy the pictures I share and would love to know what you think about them. The first photo I chose to share is one of five awesome kids that jumped a hundred times so I could get a cute picture! I think they had a fun time...I know we all laughed alot....and I believe that's what life is all about!!! " great first post!!! I can't wait to read more! love the blog site. why does that Santa Dog have foam coming out of his mouth? how long didi it take you to curl that kids hair? 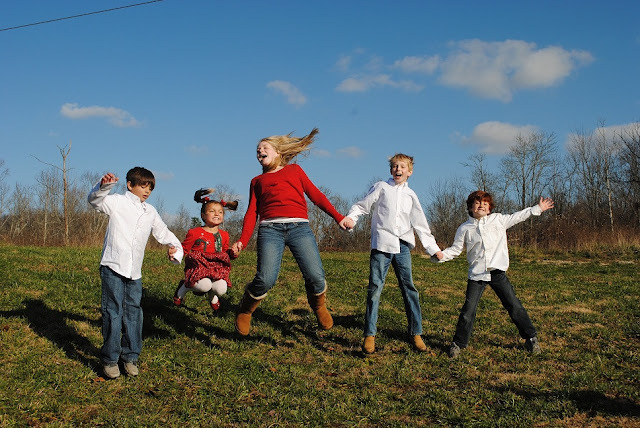 why is the kid on the far left not jumping? anyway looking forward to more be-u-ti-ful pics. So happy to see this blog. I just love Gus, (and his family)..Joyce G from facebook.